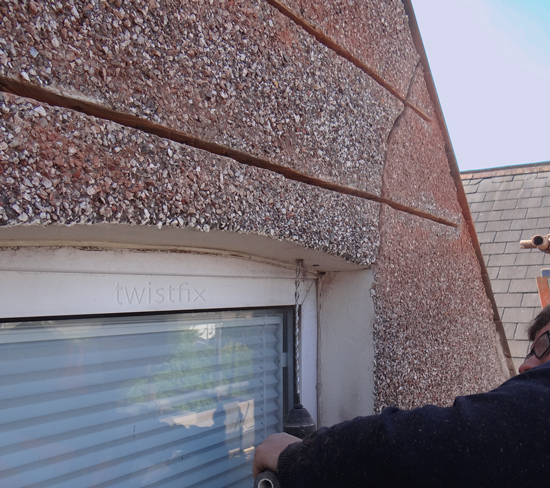 Cracks in walls above windows are a problem experienced by many householders after having new windows installed. The old frame, which doubled as a fortuitous lintel, is removed to facilitate the double glazing. The brickwork then settles onto the frame as the lintel sags and cracks. The Brick Arch Repair Kit provides everything required to reinforce weakened brick arches, lintels and soldier courses. 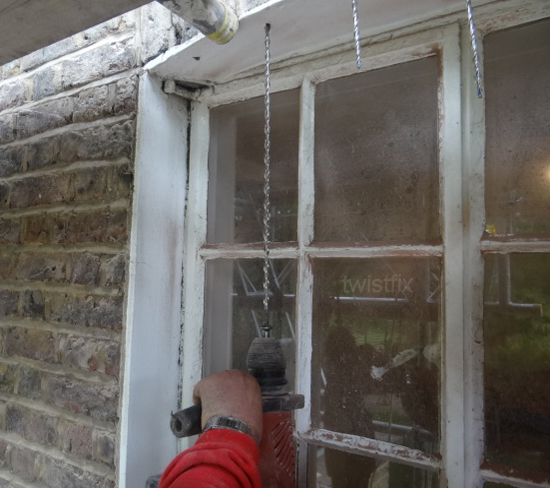 Most recently Newmans, a Twistfix registered structural repair contractor, purchased a number of these kits to form beams over failed lintels and arches on a number of properties in the Bristol and Bath area. "Uniquely we can use BRE load tables to design the retrofit masonry reinforcement beams" said Mr Steve Newman. "Many competitors profess to be expert in this field despite them having no independent test data on the bar and grout combination that they use. I am surprised that surveyors and engineers allow such systems to be utilised without detailed analysis of the loads and third party test data verification". These masonry crack repairs need to be strong and durable. The reinforcement comprises four 3.5M helical bars formed from high-tensile 304-grade stainless steel which are bedded into walls. The bar and grout combination works with the adjacent brick courses,­ forming a reinforced brick beam that supports and redistributes loads. In walls up to 230mm thick the deep masonry beams can carry a factored load of 2.6 tonnes over openings up to 2.5M wide. Two bars are inserted into a pre-cut slot, forming the bottom chord of the reinforced beam, a second pair of bars forming the top chord. Between these bars, the masonry forms the web of the beam. The newly-created reinforced zone then has retrofit brick ties installed to securely pin the brick headers. Six 305mm-long helical wall ties are supplied in the Twistfix Brick Arch Repair Kit along with an essential wall tie setting tool. These patented self-tapping ties, driven through undersized pilot-holes, effectively secure brick arches, stone lintels and soldier courses to the reinforced masonry panels above them. A comprehensive repair kit, this product is incredibly popular due to its versatility. Supplied with the helical bars and remedial brick ties is a large tub of WHO 60 masonry repair grout, a Grout-Master applicator with innovative Hi-Flo nozzle, a Helix mixer paddle and a finger trowel. 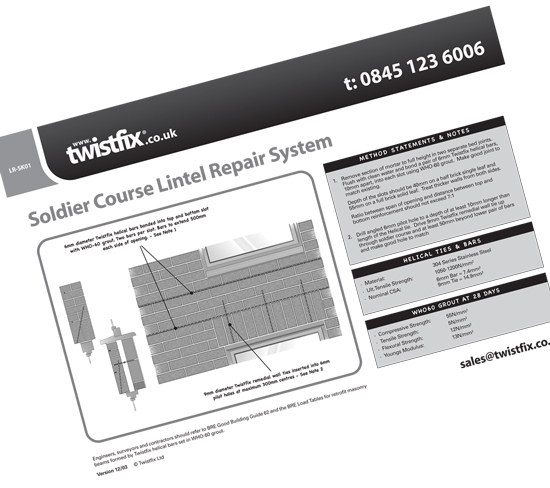 A specification sheet, quick guide and vital BRE load tables for masonry beam reinforcement are available on the Twistfix website and we recommend examining these documents thoroughly prior to using the kit to repair cracks in the wall. If you require further information or advice on any aspect of masonry rein­for­cement,­ crack repair, crack stitching or remedial wall ties, please browse our detailed online guides or contact a member of our experienced and professional team.